Early in the novel Mountains of the Moon, Louise Alder recounts how her teacher Miss Connor read Louise’s (Lulu’s) story aloud in class because Miss Connor “reckons I got a good way of putting things” (65). Author I. J. Kay (a pseudonym) has a good way of putting things as well. But that good way of hers makes for no easy read. Though the first American edition of her debut novel appeared last July, it’s no beach book. Kay’s fractured narrative forces us to read carefully for shifts in diction and setting that signal the age and whereabouts of Louise (a.k.a. Kim, Beverley, Jackie, Dawn, and Catherine) through a parade of squalor that ends with her release from prison for a crime she may or may not have committed. Confusing? Yes, but keep reading. Chances are, you’ll find yourself less confused. And more and more impressed with Kay’s achievement. At thirty-one, after her ten-year prison stint, Louise travels to Uganda to see up close those mountains she first saw as a child in the pages of her book on Africa, a gift from her grandfather. As a young teenager, she receives another book as a gift from a father figure. “The Velvit Gentleman,” as she calls him, a surreal sugar daddy—Professor Higgins and lover—gives her Lord of the Flies, which she slings across the floor of the psych ward after reading the death of Piggy. “Good,” Anton says. “That’s the point; stories tell lies in the service of truth” (287). Kay’s own lies in the service of truth ring truer than those that shock her protagonist. Lulu’s no middle-class kid stuck on an uninhabited island. Donning a Masai’s red cloth and wielding a spear or not, she’s more warrior than any of Golding’s boys. What makes her a warrior? The mountains (of the title) that dwell in her imagination, the ones she dreams of and writes about on wallpaper “wonky where the pattern is bossed” (87) to counter violence, poverty, and neglect. 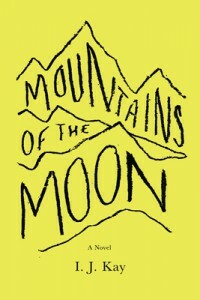 Though flawed as all novels are—and undoubtedly some of its shortcomings escaped me—Mountains of the Moon shines with fresh language, Kay’s “good way of putting things,” that invigorates Louise’s story, reminding us of what novels can achieve but rarely do. Kay. I. J. Mountains of the Moon. New York: Viking, 2012. Hi Jane, your review made me want to read this book. It sounds intriguing. Probably hard to write, as well as to read. Thanks, Lenore. It’s challenging but rewarding. I do recommend it; the writer is a great stylist.